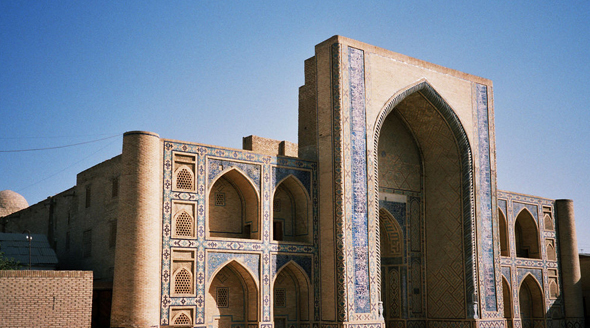 The next stop in our tour of the “new” backpacker circuit in Central Asia is Uzbekistan. Landlocked nation with the exception of the bordering Aral Sea, the Uzbek countryside is a series of deserts and dunes. It has a reputation for being unfriendly to foreigners (and perhaps unfriendly to locals too), but there’s still some gems to be unearthed. Let’s explore what Uzbek has to offer. Many wonderful sights can be explored following the route of the former Silk Road as it passes through Uzbekistan and is a good start to exploring the flat and seemingly endless countryside. Khiva is a top stop; formerly a capital city (at the time a kingdom called Khorezm), it’s now a wonderful open-air museum on a city that flourished in riches from the Silk road trade. Check out the East Gate, which was once home to a slave trade market. There’s the Tash Havli palace, with rooms for all of the different suitors and concubines. And of course, the iconic Kalta Minaret, a tower intended to be Central Asia’s tallest minaret. It stands unfinished to this day. Smarkand is another important Silk Road destination. The gorgeous dome of the Gur Emir building is a must for all photographers (it’s actually a mausoleum), as is the Registan square. From here the gates and pillars feel as authentic and iconic as more famed backdrops, like the Taj Mahal. Lastly but certainly not least is Bukhara, full of visitor attractions. The Ark, a palace, features a museum on the city’s history and the nearby Zindan is a hot spot to see the Bug Pit, a torture chamber which needs little explanation. But the real star of the show is the Kalyan Minaret, once the tallest building in Central Asia and the oldest monument in Bukhara (built around 1127). The first time it was built, it collapsed due to some mis-engineering, but it was finally erected properly and was spared by Genghis Khan when he destroyed the city in the 1200s. 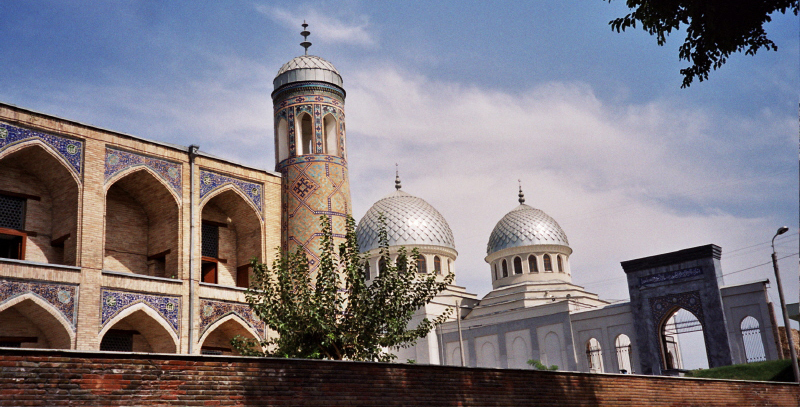 The Uzbek capital of Tashkent was destroyed in 1966 after a strong earthquake. Because the city was under strong Soviet control at the time, today the city looks far more Soviet than elsewhere in the region. Everything from traffic signs to monuments and parks have that “look” (hard to describe, but you’ll know it when you see it). But you simply must take in the Soviet influence on the Tashkent subway. The highlight is the Cosmonaut station but nearly every stop is like a museum. I can’t seem to talk about anywhere without talking about the food. But first, let’s mention something that many travelers complain about: getting ripped off. You’ll find many restaurants don’t have menus. This is so they can charge you an unreasonable fee after you’ve already eaten. To avoid this, ask for price information up front if it isn’t available, and be firm in asking for an itemized bill. Challenge it if it contradicts what you were told (though you’ll likely get footed with it anyway). Manti is a huge Uzbek favorite, no surprise as you’ll find manti in both Turkey as well as the other Central Asian states. It’s a dumpling filled with lamb (and a lot of lamb fat), then steamed. It’s delicious. 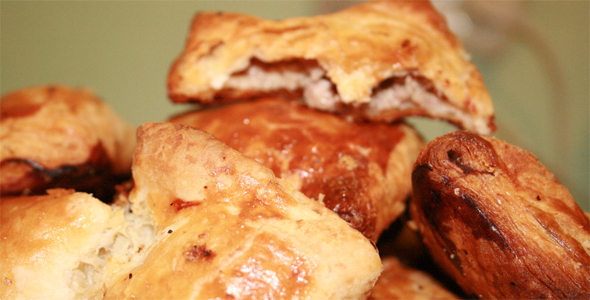 Somsas are another tasty treat that you’ll find in restaurants or even on the street; they can be filled with potatoes or pumpkin or meat. In summer you’ll see ‘spring’ somsas, which are filled with a special grass that grows in the mountains. If they’re made traditionally they’ll be put into a clay tandoori, which adds to the flavour. To wash it all down, you’ll have plenty of choice for drink (though be careful with tap water, which is usually to be avoided). Tea is a popular option, and tradition states the tea be poured from the pot to the cup and back three times, then the fourth time it is offered to the guests. Hospitality plays a huge role in Uzbek tradition, so tea cups do not stay empty for long. Uzbek also has some great wines, believe it or not. Khovrenko Winery is one of the most well known, but there’s several in the country. You can even go to a wine tasting in Bukhara in the west. You’ll of course need a visa to visit Uzbekistan. The Ministry of Foreign Affairs website explains the process and fees in detail. For many, you’ll need a Letter of Invitation, which your travel agent or accommodation can obtain for you. Once you arrive in the country, you’ll need to register your local address, but if you stay at a respectable hotel they’ll handle this for you, but just be sure that it is taken care of. If you’re flying in, the main entry point is through Tashkent, served by several European and International carriers, as well as Middle-Eastern Airlines such as Turkish Airlines and Uzbekistan Airways. Check out CheapFlights.co.uk for some excellent flight deals heading to Tashkent. • You’re required to carry documentation with you at all times and may be asked to see it by a police officer. Most embassy websites state that it is sufficient to carry copies of your passport (and Uzbek visa!) and leave the originals at the hotel and offer to take the officer there upon request. They won’t usually bother. • You’ll often be propositioned to check out the “night life” – either by local tour guides or just those on the streets. Trust us, you aren’t interested in what they have to offer, just say no. • Otherwise, just use common sense for safety. Don’t wear expensive jewellery or carry bags/purses that could be easily stolen. Street crime is just as big of a problem as overall violent crime in the region. Unearthing Asia is a travel zine focusing on Lifestyle, Culture and Attractions all over Asia. Don’t miss out on the best travel ideas and inspirations in the region of Asia, such as this list of top Vietnamese noodle treats. About the Author. Andy Hayes. Andy Hayes is a freelance travel writer and photographer based in Edinburgh, Scotland. When not crossing the world to have his next Asian travel adventures, he is hitting the walking trails near home. To get in touch or see Andy’s other travelogues, visit his website, Sharing Travel Experiences.